What Are the Health Benefits of Solomon's Seal Tea? Solomon’s Seal Tea can be used to help heal a wide variety of ailments, from sports injuries to gastrointestinal inflammation. This versatile herb has a rich history. People in North America, Europe, and Asia have used it for centuries in different forms--as an herbal tincture, a salve, a tea drink or a supplement in pill form. Solomon’s Seal Tea can help repair sports injuries and other acute trauma to the body’s muscles, tendons, ligaments, bones, joints and cartilage. It can benefit the body’s entire muscular and skeletal system by strengthening and repairing it by tightening or loosening muscles, ligaments, and tendons as needed; helping damaged tissues return to their original states; creating a balance that can correct old injuries and help prevent new ones; and helping the body produce more or better quality synovial fluid so that joints have less friction. When applied as a salve externally, Solomon’s Seal can speed up the body’s process of healing wounds and bruises. It helps remove congealed blood and draw out infected fluid, as well as foreign material, such as dirt. Some people use Solomon’s Seal Tea to help them recover quickly from surgery. People have used Solomon’s Seal Tea to reduce the severity of gastrointestinal issues such as indigestion, heartburn, diarrhea and ulceration that are often caused by inflammation. It soothes irritated or damaged tissues while feeding on healthy bacteria inside the body. Some people who suffer from inflammation brought on by arthritis report finding relief from pain after using Solomon’s Seal Tea. Women sometimes use Solomon’s Seal Tea to reduce the severity of their menstrual cramps. In addition, people sometimes use Solomon’s Seal Tea to reduce skin inflammation such as sunburn, pimples and skin tumors or to improve their complexions such as by preventing freckles and reducing the skin mottling that can occur in old age. 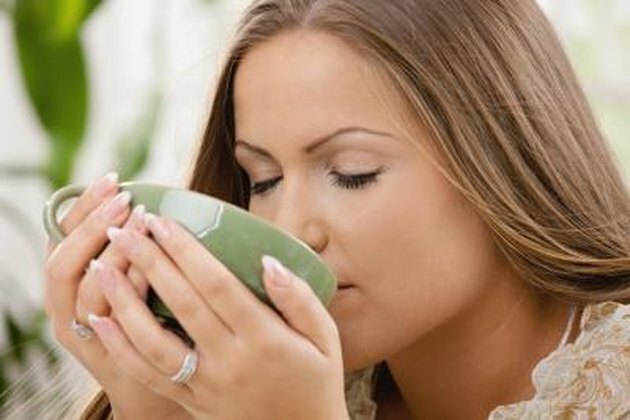 As an expectorant, Solomon’s Seal Tea can help clear up lung congestion. People commonly use it to treat coughs, since it can help loosen mucous in the lungs and soothe throat irritation. In centuries past, people have also used Solomon’s Seal to treat conditions such as pulmonary consumption, tuberculosis and lung bleeding. Solomon's Seal Tea offers other benefits beyond its power to relieve injuries, reduce inflammation and clear up lungs. People have sometimes used it to help lower their blood pressure or to increase their mental clarity and concentration. A truly versatile tea, Solomon's Seal can prove useful in treating a wide variety of ailments.